We are a friendly and active club located within the Moor Allerton Sports and Social Centre in Moortown which is on Stonegate Road. The club has full facilities for the disabled and on-site parking. 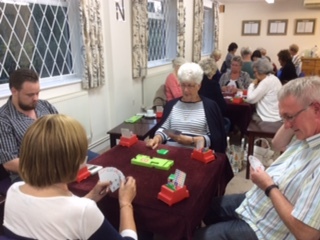 We offer a range of pairs and teams events five days a week for bridge players from beginners to experts. Visitors and new members are always welcome whatever their standard. 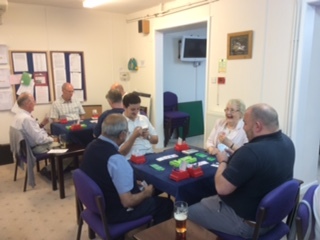 We run pairs duplicate tournaments on Mondays, Tuesdays, Wednesdays, Thursdays and Saturdays. We also run teams events on Wednesdays. (View our full calendar of events). All members are invited to put themselves forward to play in one of our six teams in the Yorkshire League. We hold Chicago bridge sessions on Monday and Thursday mornings. These are hosted and non-competitive. We operate a host system on Tuesdays and Thursdays for those who do not have a partner on a particular evening or our members can put an advert on Pianola for a partner. We can also try to help you find a regular bridge partner. Please contact our partner finders. The Club is comfortable and well-equipped. We play pre-dealt hands, use Bridgemates for electronic scoring and publish our results online using Pianola. There is an on-site bar, and we offer quality catering at some of our annual events. Congratulations to the Leeds A team who won the Yorkshire League this season. Pictured in the group photograph are, from left to right, Alan Brosgill, Mike Ferguson, Tony McNiff, Martin Edge, Alan Hayward, Richard Winter, Tom Cohen, Nick Woolven and Bill Townsend and shown individually are A-team players Sarah Teshome and Robin Jepson. To get in touch, please email secretary@leedsbridgeclub.com or complete this form.